The colored tissue paper gives this project almost a stained glass look. I used two colors of blue and two colors of green for the sample, but other combinations of tissue could be used. Then the background color would be changed to accent the colors chosen. 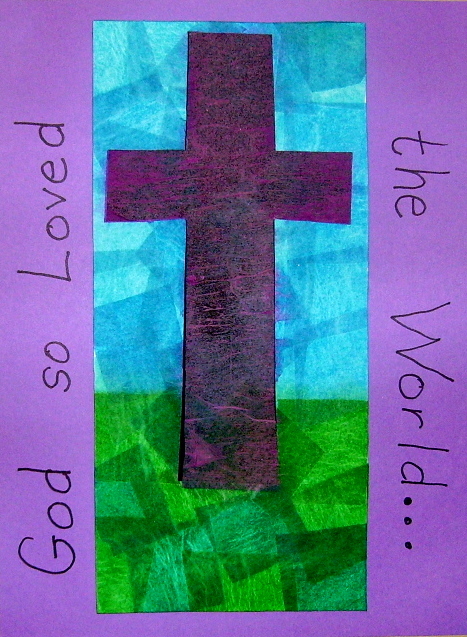 This project, “God So Loved the World….,” is found in the 4th Grade Projects Gallery in the sidebar. Click on the picture for a closer view. This entry was posted in Categories and tagged 4th grade, arts and crafts, childrens lenten projects, classroom lenten projects, easy classroom lenten projects, easy lenten art projects for kids, god so loved the world, lenten art, lenten projects for kids. Bookmark the permalink.